Assisted by a qualified workforce and advanced manufacturing unit, we are engaged in offering a wide range of Automatic Filling & Sealing Machine. 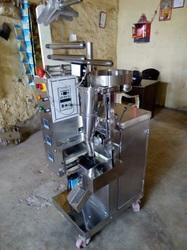 The offered machine requires pouch width 60mm – 300mn. Pouch length 380mn to 900mn. It has a motor attached having 1/4 HP or ½ HP; 220 V. Apart from this, clients can get the machine manufactured by us according to their business requirements. Looking for Automatic Packaging Machine ?